Chin chin! It’s time to raise a glass and toast to two years of Apricosa! Today’s a great day for celebrating—not just the marker of another year of food and fun here at Apricosa, but many wonderful events going on in the lives of friends and family this month. My college roommate’s beautiful wedding in the Bay Area…followed by the absolutely romantic Santa Ynez ranch-style wedding of two dear friends...the little brother’s graduation from Stanford...my upcoming travels to eastern Asia...and let’s not forget the parents’ wedding anniversary this month as well! 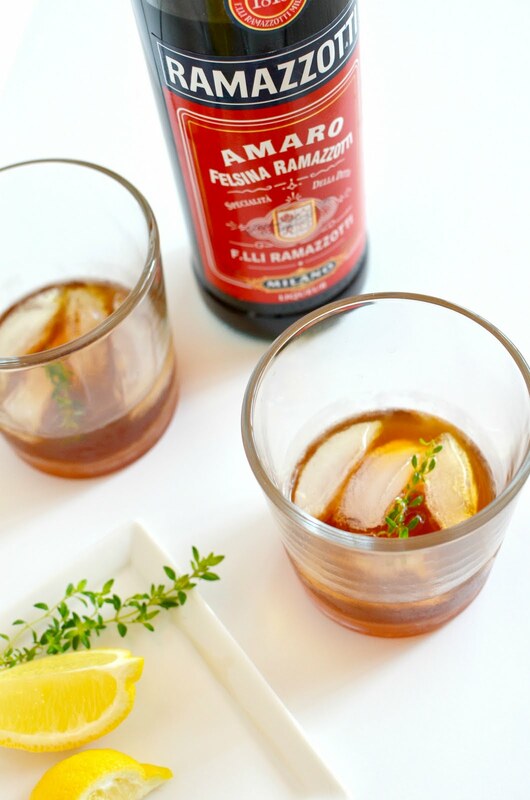 And so, here is a special drink for these happy times, made with one of my absolute favorite liqueurs ever: Ramazzotti Amaro. Ramazzotti, all the rage throughout Europe (especially Germany) in recent years, is an Italian herbal liqueur in the same family as Jägermeister. I remember having my first taste of this liqueur as a digestivo after an exquisite Italian meal in the Neuenheim district of Heidelberg. It was served on the rocks with just a twist of lemon, and my world has not been the same since. 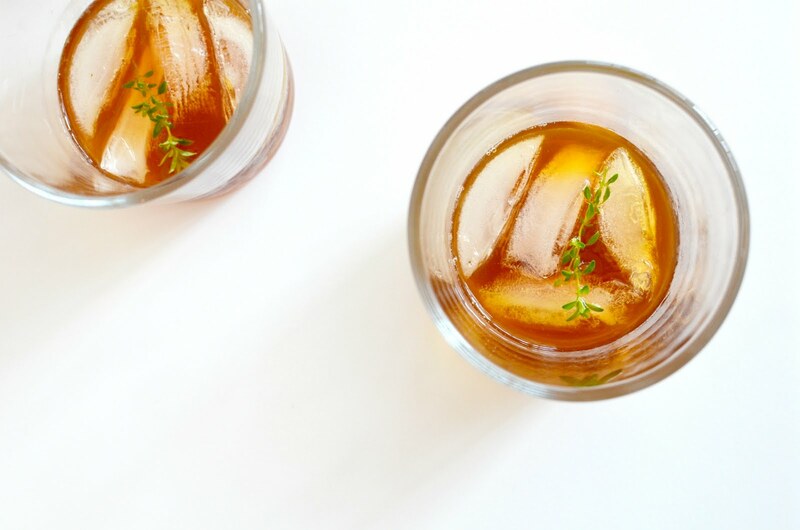 I just love having a little sip of this now after a fine meal--there's something so civilized yet indulgent about having an after-dinner drink! And how it wonderfully complements a dinner and refreshes the palate is an experience that ought to be instituted at every dinner table. But digestivos aside, let's talk about cocktails now. Here, I’ve mixed up this fantastic Ramazzotti together with whisky for a fun aperitif along the lines of a Manhattan. 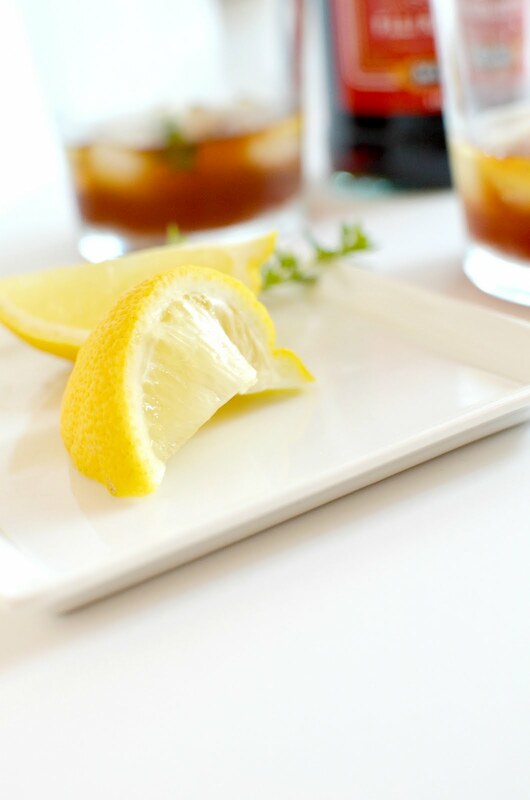 And grabbing a few lemons from the garden, I added a splash of freshly-squeezed lemon juice, which enhanced the floral nature of the slightly bitter Amaro beautifully. 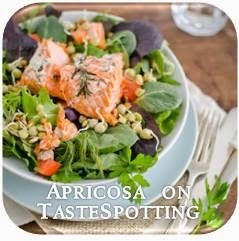 So come, mix yourself up a glass and let’s raise a toast to Apricosa! To borrow a phrase from my little nephew on the occasion of his last birthday, "I'm two!" Whisk together the first 5 ingredients together in a pitcher until sugar is dissolved, then mix in ice cubes. Divide between two Old Fashioned glasses and garnish with fresh thyme sprigs. Keeping with the German theme here ... zum Wohle und Glückwünsche! A milestone passed ... on to more success with Apricosa! Congratulations! I haven't had the best experiences with Jägermeister (but I'm guessing I shouldn't paint any liquors of the same family with the same brush), in honor of your anniversary though, I'll go ahead and give it a try! swell toast to Apricosa!! with so much happening....you really need tht extra kick in your CNS!! thank you friends for the "birthday" wishes! :) it's people like you that make blogging so much fun! Happy 2 years of wonderful food blogging! check out my cake blog!